Our native British garden birds are establishing themselves, in their territories, their feeding domains and building nests. Our migratory birds are beginning to arrive to join in this jostling, territorial and nesting frenzy. Swallows and swifts will soon be here from Africa and we await the first confirmation of Spring with the iconic sound of the cuckoo. I have bird feeders in the garden, which this year, are mostly frequented by house sparrows. They are highly vocal, chirping, chattering, gregarious little birds. They feed in crowded flocks, squabbling over crumbs or seeds. I also see them bathing in street-side puddles or dustbathing on open ground, ruffling their feathers and flicking water or dust over themselves with similar motions. I was reading that the house sparrow is strongly associated with human habitation, and mostly live in urban or rural settings. Though found in widely varied habitats and climates, they typically avoid extensive woodlands, grasslands, and deserts away from human development. They feed mostly on the seeds of grains and weeds, but it is an opportunistic eater and commonly eats insects and many other foods. Its predators include domestic cats, hawks, owls, and many other predatory birds and mammals. It is interesting though, that UK house sparrow populations have fluctuated greatly over the centuries, with a gradual decline during the last 100 years. Causes for the rapid recent declines, particularly in urban and suburban environments, remain largely undetermined, although research is underway that aims to establish the cause(s), and develop conservation solutions. House sparrow numbers were not monitored adequately before the mid-1970s. Since then, numbers in rural England have nearly halved while numbers in towns and cities have declined by 60 per cent. Because of these large population declines, the house sparrow is now red-listed as a species of high conservation concern. The Royal Society for the Protection of Birds (RSPB), encourage the public to take part in the annual Big Garden Birdwatch 2018. The survey has been running since 1979, so they've now got 39 years of data to look back on. Participants are requested to record, for an hour, the number of birds and their species, that visit their gardens. In 2018 this was done for any sample hour of choice, between the 27th and 29th of January. There are many ways to replicate, symbolise and celebrate the beauty and wonder of our feathered friends. One way of doing this is to purchase one of the many bird related homeware items from Brilliant Wall Art. 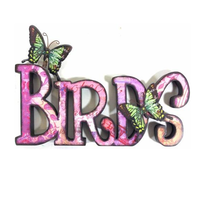 Check out our website for metal bird wall art, wooden bird ornaments or glass bird décor. Brilliant Wall Art is the Midlands premier wall art, home and garden accessory specialist. Based in Birmingham, Brilliant Wall Art have been providing decorative metal wall art and home accessories since 2006 with our primary goal being customer satisfaction. The experts at Brilliant Wall Art provide an extensive range of contemporary and quality decorative wooden wall art, metal wall art, other home and garden accessories, at the lowest possible prices. There are a number of metal bird bath and feeder gift products, to explore. My personal favourite is the Metal Verdi Green Bird Feeder Bath. It is finished in an aged, distressed shabby chic antique grey, green and whitewash, with bird and floral detail. It can be a freestanding item or it can be hung using the top hook. It is ideal for any garden! Birds are just one theme across a myriad of wall art products at Brilliant Wall Art. Metal Wall Art, Wooden Wall Art, Rope Wall Art, Resin Wall Art, Glass Wall Art. What is your favourite? What inspires you? What is your love or passion? Music, instruments, nature, flowers, trees, marine, nautical, vehicles, cars etc.? We have the lot (no sparrows, though).